At the leading dairy farm training centre in Israel we educates dairy professionals with tailor-made seminars based on years of proven experience. 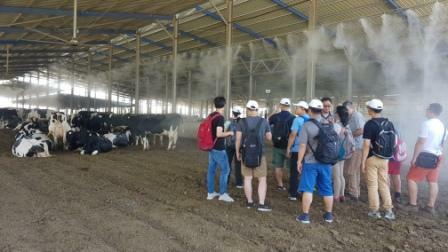 You will have a chance to participate in seminars with the most sought-after experts in the Israeli dairy industry, visit local dairy farms, and obtain first-hand knowledge of dairy herd management and the technologies that has enabled the Israeli dairy industry to reach such high levels of prestige. Special seminar program for dairy organizations and dairy companies. Our next Summer Herd Management Seminar will take place in Israel during the 23-27 of June 2019. Do not miss this once a year opportunity! In our team you will find more than 50 of the beast Israeli experts in the dairy and dairy herd management area, all our with many years of proven success experience. Each seminar is tailor-made to suit the needs of the group. While the ideal group size is eight people, the school caters to groups of all sizes. The Dairy in Israel School works with group leaders to design a seminar that fits the group’s particular needs. The time for your visit and the duration of the seminar can adjust according to your needs. Typical seminar duration is 5- 8 days. Join us with your best friends or colleague; get your own private seminar. Small group size of 5 people and more are welcome. You don’t have to to worry we take care of all aspects of your visit: transportation from airport, 3 meals a day, professional lectures, professional tours and sightseeing, accommodation is also arranged according to your request and budget. You will also have the opportunity to visit to some of Israel’s most recognizable religious and historical sites. Led by the country’s top licensed professional tour guides, guests are also treated to sight-seeing tours at Israel’s historical and religious holy sites. The Dairy in Israel School provides a unique opportunity for the culmination of education and travel in one unforgettable trip. There is no better way to have the ultimate Israeli experience, the best from the land of milk and honey.